An application assembler can set the roles that are allowed to invoke an EJB's home and remote interface methods through method-permission element declarations. 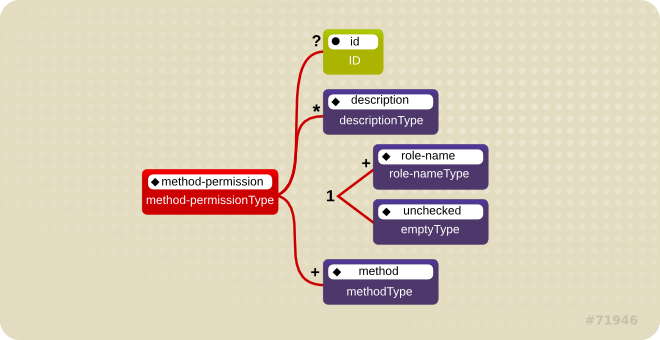 Each method-permission element contains one or more role-name child elements that define the logical roles that are allowed to access the EJB methods as identified by method child elements. You can also specify an unchecked element instead of the role-name element to declare that any authenticated user can access the methods identified by method child elements. In addition, you can declare that no one should have access to a method that has the exclude-list element. If an EJB has methods that have not been declared as accessible by a role using a method-permission element, the EJB methods default to being excluded from use. This is equivalent to defaulting the methods into the exclude-list. There are three supported styles of method element declarations. If there are multiple methods with the same overloaded name, this style refers to all of the overloaded methods. The method must be defined in the specified enterprise bean's home or remote interface. 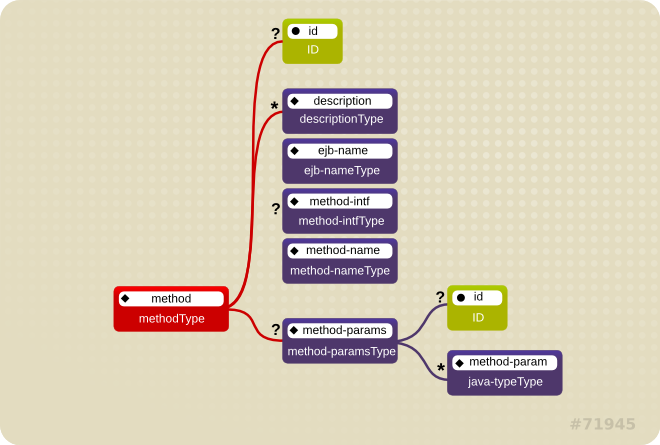 The method-param element values are the fully qualified name of the corresponding method parameter type. If there are multiple methods with the same overloaded signature, the permission applies to all of the matching overloaded methods. The optional method-intf element can be used to differentiate methods with the same name and signature that are defined in both the home and remote interfaces of an enterprise bean. Example 2.6, “An ejb-jar.xml descriptor fragment that illustrates the method-permission element usage.” provides complete examples of the method-permission element usage. Example 2.6. An ejb-jar.xml descriptor fragment that illustrates the method-permission element usage.